What is the Atari 2600 CE? 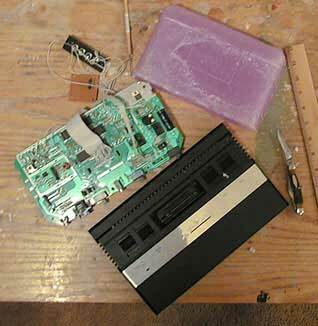 The Atari 2600 CE is my project to create a mass-producable Atari 2600 portable. Complete Entertainment - An idea I had recently. I'm using a TV with a tuner for the display. I need to keep the circuitry anyway, since the screen driver is on that board - why not leave a hole in the back of the case for the antenna to fit through? I'm already using the TV's audio and video in for the 2600, why not provide ports on the back of the unit as well? The long and the short is that you'll be able to watch TV, watch DVD or VCR movies, use the unit as a portable game system, or as a totable console that can be hooked up to a standard TV. Cool huh? I am a huge classic gaming fan, and I've recently started collecting classic consoles. The Atari 2600 VCS has some special memories for me - when I was 11, I was diagnosed with Acute Lymphocytic Leukemia, and was basically shut-in for over a year. My mom bought a 2600 for me, since I had enjoyed playing one so much in the hospital (I rolled Space Invaders when I was in the hospital). Anyway, The 2600 and the Commodore Vic-20 and C64 that my grandparents bought for me kept me occupied, and ultimately determined my life's work. I have a lot of great memories playing my 2600. A couple of months ago, I stumbled on Ben Heckendorn's 2600 VCSP site and thought, "What a great idea!" I couldn't find the site again until it was announced that he was now hosted on Classicgaming.com, one of my daily sites. Ben was (and is) working on his next-generation Atari 2600 portable, the Vagabond. After reading through the story so far, looking at his how-to section, and doing further research on ye olde intrenete, I decided to create my own version. My project has two distinct prongs that I am working on simoultaneously; the case and the guts. The 2600 CE will be a horizontal unit (like the Game Gear, Nomad, and Game Boy Advance) There have been many developments in the last couple of weeks, so please see the case section of the site. I purchased two 3-chip Atari 2600 Juniors, and am currently designing a slimmed-down schematic. My intent is to design a replacement circuitboard that I'll have an outside company produce for me, on a nice, small circuitboard. For more info, go to the guts section of the site. The other thing to note is that I intend for the 2600 CE not only to be portable in the Game Boy sense, but all of the necessary external connections will be present to use it in a console mode! Also, the 2600 CE will have a paddle controller mounted onto the unit so you can play Kaboom or Super Breakout on the go! As for the mass-producable claim, I'm working on getting outside companies to build the case and guts for me in true production facilities so that the 2600ce will be long lasting, rugged, and cool. Comments? Questions? Answers? Email me!